What about love! The love we share for family, friends, animals, shapes and beauty. Beauty and love are all around us ... Inside the single sewn signature, with wrap-around clamshell cover, four quotes that speak to me of love. One of the quotes, by Lao Tzu, is a copy of a cross-stitch I made as a child. More surprises are in the pop-out explosion insert -- a love stamp, a wire shaped heart, a quote written on shaped cardstock. Text: 24# Marble Linen Gray. Cover: Mauve 80# Royal Fiber. 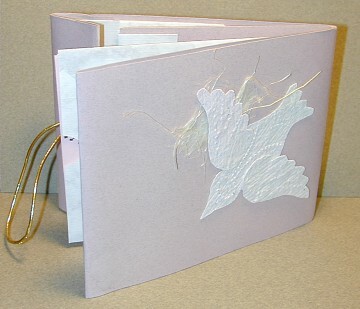 The lovebird on the cover is handmade paper. Size: 6" wide by 4¾".